** Please help yourself to the free literature and flyers available in our resort office for additional information about these and many other places of interest in & around the Sarasota/Bradenton area. Amenities in this beautifully new park include basketball court, shuffleboard courts, tennis and pickle ball courts, picnic tables and grills, playgrounds, and a multi-purpose ball field for soccer and softball. All located on the Sarasota Bay with kayaks and launch. Ride for miles on flat ground over trails, bike-friendly byways, and through quaint neighborhoods. If you are looking to rent bikes, the staff in the office can direct you to a number of bike rental options in the area. 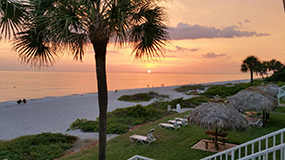 There are many different spots to explore on Longboat Key. Across from the Diplomat Beach Resort, you can bike along the Sarasota Bay while enjoying views of boat docks & wildlife. To the north is the charming Joan M. Durante Park which has numerous walkways that wind toward the bay through green areas abounding with flowers & shade trees. Big Cat Habitat & Gulf Coast Sanctuary is an ever-growing large-animal rescue in eastern Sarasota County. Founded in 1987 by Kay Rosaire, the non-profit sanctuary is a permanent home for dozens of exotic animals, offers placement for animals in need, and works to educate the public about animal care and conservation. Adventure awaits with an unparalleled mixture of thrill rides, shows & animal encounters. Sarasota’s unique entertainment experience for kids and grown-ups alike. Livingston’s is your one-stop shop for hours of fun, food, & entertainment. Featuring Billiards, Go Kart Racing, Phazer Zone, Rock Climbing, Arcade & Prize Center, Food & Bar, and Events & Parties. If you’re looking for a fun full night for the whole family or just for the kids this is the place for you. A spectacular orchid center with tropical display house, gardens, grounds & boardwalk by the bay. Explore the wonders of the sea at the 135,000 gallon shark exhibit and touch pools with rays & sea creatures. See a preserved giant squid and visit with manatees, sea turtles, otters & more. Florida's largest State Park. See alligators, many species of birds, deer, feral pigs & bobcats. Enjoy nature trails, observation decks & airboat tours. 1708 Ken Thompson Parkway, Sarasota, Fl. Come out for a day of outdoor play in the trees at Southwest Florida’s only elevated adventure course. Bring the family, get together with friends or grab a group from the office for an adrenaline-pumping activity that has something fun for everyone. Book your reservation, come prepared, then swing into action on wobbly bridges, hanging nets, bungee swings, swinging logs, foot bridges, Tarzan ropes, ZIP lines, and more.